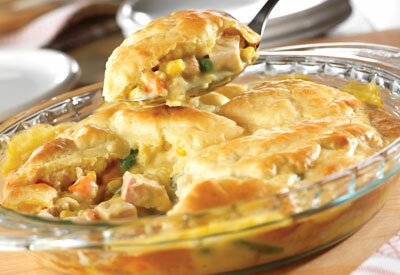 Roast poultry and vegetables are paired in a creamy sauce and topped with a golden biscuit crust. 2) Stir the soup, vegetables and turkey in a 9- inch pie plate. 3) Stir the milk, egg and baking mix in a small bowl. Spread the batter over the turkey mixture. 4) Bake for 30 minutes or until the topping is golden brown.